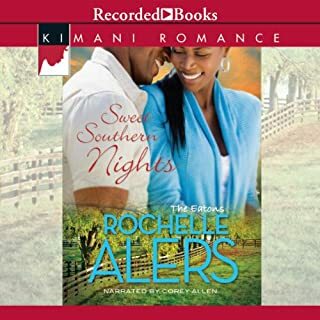 An Essence best-selling author, Rochelle Alers also boasts a Romantic Times Career Achievement Award and Zora Neale Hurston Award. Sweet Southern Nights continues the Eaton family saga, which finds Dr. Levi Eaton far from his Northern roots, volunteering at a Kentucky clinic. There he meets Angela Chase, whose sultry Southern hospitality is just what the doctor ordered. But as their relationship deepens, Angela worries Levi may discover the secrets she’s been hiding. First time reading or listening to your book and really, really loved it. I was a bit disappointed at the end, the character gave in too easily. It was as if her month of suffering was not worth it, I would have loved an epilogue, to see the end through ( the wedding plan and wedding). Overall the story and writing is beautiful.